DICKENS, FRANCIS JEFFREY, NWMP officer; b. 15 Jan. 1844 at London, England, fifth child and third son of Charles Dickens and Catherine Hogarth; d. unmarried 11 June 1886 at Moline, Ill.
Francis Jeffrey Dickens inherited none of his famous father’s literary talent. He was educated at a school for English boys at Boulogne, France, but did poorly, perhaps because he stuttered and was partially deaf. After a short stay in Germany in 1859, where he began studies in medicine, he returned to London and was employed for a time as a clerk in a commercial firm. He then worked in a minor editorial capacity on his father’s magazine, All the Year Round (London). This arrangement suited neither father nor son, and after failing the Foreign Office examination Francis obtained a commission in the Bengal Mounted Police in February 1864, largely through family influence. Dickens spent the next seven years in India, returning to England in 1871 after the death of his father. The next three years were spent dissipating his inheritance and quarrelling with his family. By 1874 he was penniless, and his sister appealed to the governor general of Canada, Lord Dufferin [Blackwood*], a family friend, to find him a position with the recently formed North-West Mounted Police. Prime Minister Alexander Mackenzie* was able to oblige and Dickens was appointed sub-inspector (the title was later changed to inspector) on 19 Oct. 1874. Dickens was assigned to D division, then stationed at the temporary headquarters of the NWMP at Dufferin, Man. For the next six years he moved with the headquarters from Dufferin to Swan River Barracks (Livingstone, Sask.) and Fort Macleod (Alta), and finally to Fort Walsh (Sask.). To be kept under the eye of the commissioner this long could mean either that an officer was marked for promotion or that he was considered a bad risk for an independent command. Dickens’ fitness reports leave no doubt that those in charge were reluctant to trust him. His superiors consistently rated him as lazy, alcoholic, and unfit to be an officer in the NWMP. The accuracy of these evaluations was amply demonstrated after Dickens was finally posted away from headquarters. Taking charge of a 12-man detachment at Blackfoot Crossing (Alta), Dickens, between June 1881 and January 1882, was involved in three incidents which nearly resulted in the annihilation of his detachment by Blackfoot Indians. In all three, Dickens, acting on complaints from whites, attempted to arrest Indians accused of crimes without the customary effort to hear their side of the story and secure the cooperation of the tribal leaders. In each case the Indians resisted arrest and a perilous armed impasse was reached. The first time Dickens was rescued by the quick thinking of a subordinate; the second time by the intervention of Chief Crowfoot [Isapo-muxika]. The third and most serious incident required not only Crowfoot’s influence but the summoning of reinforcements under Superintendent Lief Newry Fitzroy Crozier*. Crozier was forced to back up Dickens’ ill-considered actions, but relations between the police and the Blackfoot were permanently impaired. Dickens was subsequently placed under the close supervision of Crozier. When Crozier was given command of D division at Battleford (Sask.) in September 1883, Dickens accompanied him and was assigned to command Fort Pitt. It was here during the rebellion of 1885 that Dickens was involved in the most famous incident of his career. After the opening of hostilities at Frog Lake (Alta) on 2 April 1885, some 28 civilians sought refuge in Fort Pitt. Eleven days later Big Bear [Mistahimaskwa] and his followers led by Wandering Spirit [Kapapamahchakwew] and Āyimīsis appeared and demanded the surrender of the fort. Dickens refused and two days of negotiations followed which came to an end when a scouting party of three policemen stumbled onto the Cree camp. In the ensuing gun-fight one constable was killed, a second was wounded, and the third was taken prisoner. At this point the civilians in the fort decided to give themselves up to Big Bear because Fort Pitt was poorly sited for defence and lacked an internal water supply. Dickens then decided to abandon the post and retreat down-river to Battleford. A scow was hastily constructed and after six days Dickens and his men reached safety. Dickens took no further part in the rebellion. Until September 1885 he acted as a justice of the peace at Battleford and presided over the preliminary hearings of some of the rebel prisoners. He left the force in spring 1886, the government declining to find him employment elsewhere in the public service. 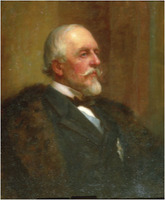 After a lengthy dispute over the size of his retirement gratuity, Dickens headed in June for the United States to begin a lecture tour. On 11 June, just before he was to deliver his first lecture at Moline, he died, apparently of a heart attack. Francis Dickens made a definite, if negative, impact on the Canadian west. He was partly responsible for the serious deterioration in relations between the NWMP and the Blackfoot in the 1880s. 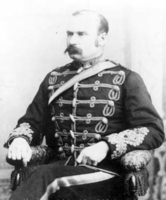 His misadventures also contributed to the strong prejudice against English officers that existed in the mounted police in the late 19th century. PAC, MG 27, I, B3; RG 18, A1, 5, 6, 9,12. Royal Canadian Mounted Police Arch. (Ottawa), Service file 0/29 (Francis Jeffrey Dickens). Can., Parl., Sessional papers, 1882, VIII, no.18; 1886, VI, no.8a. Ronald Atkin, Maintain the right: the early history of the North West Mounted Police, 1873–1900 (London and Toronto, 1973). P. A. W. Collins, Dickens and education (London and New York, 1963). S. W. Horrall, The pictorial history of the Royal Canadian Mounted Police (Toronto, 1973). J. P. Turner, The North-West Mounted Police, 1873–1893 . . . (2v., Ottawa, 1950). Vernon LaChance, “The diary of Francis Dickens,” Queen’s Quarterly, 37 (1930): 312–34. James McCook, “Inspector Dickens, N.W.M.P.,” Blackwoods’ Magazine (Edinburgh), 311 (January–June 1972): 122–33. John Manning, “Inspector Frank Dickens of the North West Mounted,” Colorado Quarterly (Boulder, Colo.), 8 (1959–60): 63–75. Roderick Charles Macleod, “DICKENS, FRANCIS JEFFREY,” in Dictionary of Canadian Biography, vol. 11, University of Toronto/Université Laval, 2003–, accessed April 19, 2019, http://www.biographi.ca/en/bio/dickens_francis_jeffrey_11E.html.